Editors: Mohammad Jawaid Sami Boufi Abdul Khalil H.P.S. Cellulose-Reinforced Nanofibre Composites: Production, Properties and Applications presents recent developments in, and applications of, nanocellulose as reinforcement in composite and nanocomposite materials. Written by leading experts, the book covers properties and applications of nanocellulose, including the production of nanocellulose from different biomass resources, the usefulness of nanocellulose as a reinforcement for polymer and paper, and major challenges for successful scale-up production in the future. 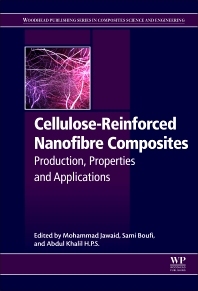 The chapters draw on cutting-edge research on the use of nanosized cellulose reinforcements in polymer composites that result in advanced material characteristics and significant enhancements in physical, mechanical and thermal properties. The book presents an up-to-date review of the major innovations in the field of nanocellulose and provides a reference material for future research in biomass based composite materials, which is timely due to the sustainable, recyclable and eco-friendly demand for highly innovative materials made from biomass. This book is an ideal source of information for scientific and industrial researchers working in materials science. Sami Boufi is a Professor at the Chemistry Department of the Faculty of Sciences of Sfax, Tunisia, and a Researcher in the LMSE (Laboratory of Material Sciences and Environment). His research activities focus on nanocellulose and nanoparticles from biopolymers, composites and nanocomposites based on lignocellulosic filler and nanocellulose, and heterogeneous polymerization (emulsion, miniemulsion and suspension). Prof. Boufi has authored or co-authored over 130 papers in peer reviewed journals, and 3 book chapters. Abdul Khalil H.P.S. is a Senior Professor in biomass and biocomposites at the School of Industrial Technology, Universiti Sains Malaysia, Penang, Malaysia. His specialisms include biocomposites technology, hybrid composites, nano-based composites, and fibre science (natural and man-made fibre). Prof. Abdul Khalil is a Fellow of the Institute of Materials, Minerals and Mining (FIMMM), in the United Kingdom. He is a member of the America Chemical Society and a member of Wood Science and Technology. He has been appointed to the editorial board of more than 5 Scopus/ISI listed journals. Prof. Abdul Khalil has a total of 180 publications to his name, and has published 3 academic books and 40 book chapters. He has also reviewed over 200 journal articles.